Fishing is not just an important local industry in St Helena – it’s a part of the island’s culture. A number of species are commercially caught within St Helena waters, including yellowfin tuna (Thunnus albacares), bigeye tuna (Thunnus obesus), skipjack tuna (Katsuwonus pelamis), albacore tuna (Thunnus alalunga) and wahoo (Acanthocybium solandri). The following profiles have been summarised from landings information recorded since 1977. 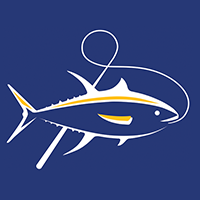 Yellowfin are caught throughout the year in St Helena waters and are the mainstay of the inshore fishery. 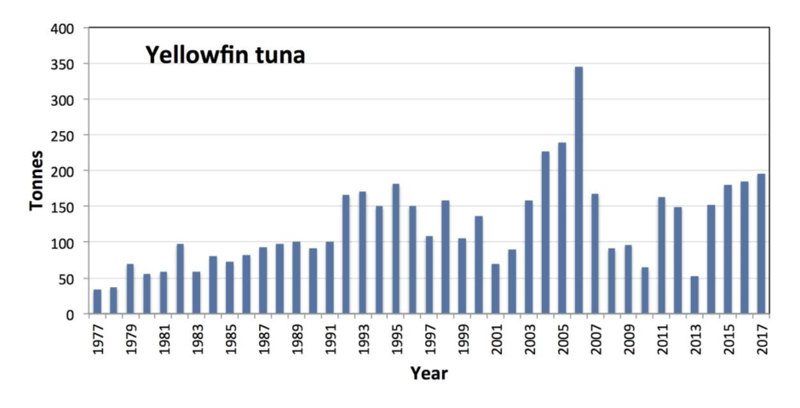 A broad range of sizes of yellowfin are caught in St Helena waters and evidence from tagging studies (Westerdam in the 1980s and the recent Darwin Plus project [Clingham, 2015]) indicates that immature yellowfin tuna remain in St Helena waters for an extended period (6 months to a year), where they feed and grow (Collins, 2017; SHG, unpublished data). They are then assumed to migrate to spawning grounds as they begin to mature. In the St Helena EEZ, the best catches of bigeye are usually associated with the Cardno Seamount in the north of the zone (Collins, 2017), particularly on the eastern bank. Over the last 20 years, the average annual catch has been 26 tonnes but in 2011, when the inshore vessels fishing around the island had excellent catches of bigeye, the St Helena annual catch was 190 tonnes. 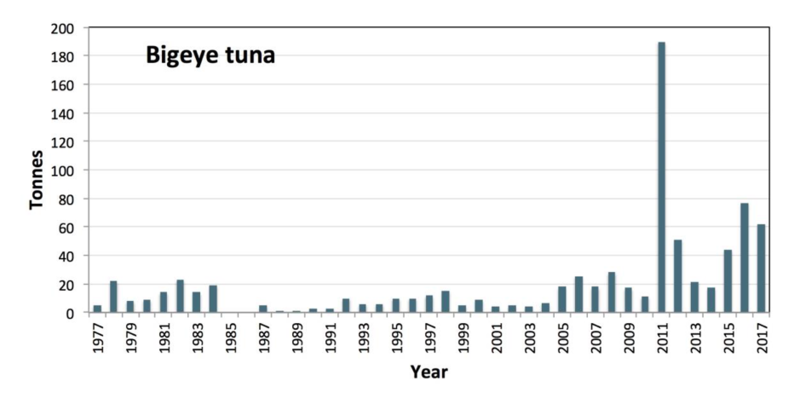 In July and August 2013, a South African flagged pole and line vessel (Southern Cross) that was fishing under an exploratory licence caught over 100 tonnes of bigeye near the Cardno Seamount (not included in the figure below as the fish were not landed in St Helena). Following the Southern Cross venture, three of the offshore vessels have fished at the same location and obtained reasonable catches of bigeye. 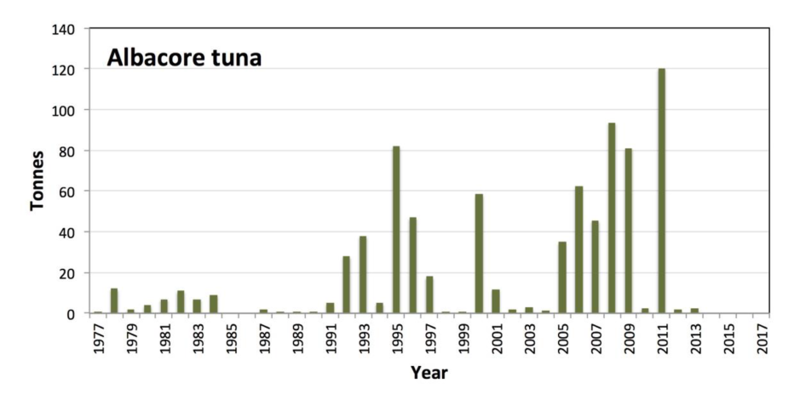 Catches in St Helena waters have been sporadic, with occasional years of high catches (e.g. 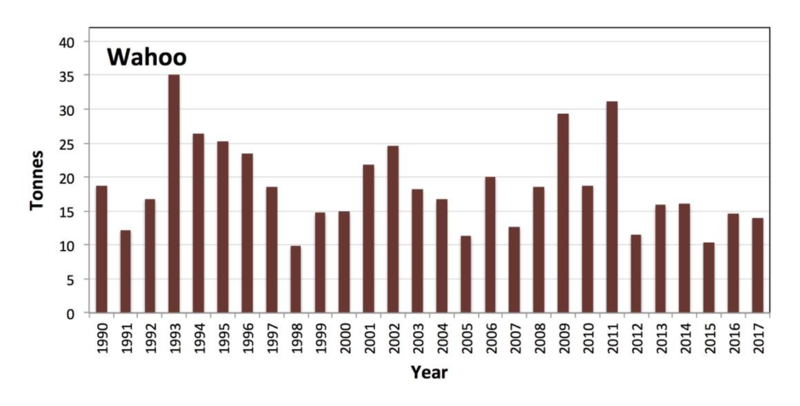 1989 and 2011 when catches were over 350 tonnes) interspersed with years of poor catches (e.g. 1999 and 2013). The high catches in 2011, were followed by four years of low catches, due to low abundance of skipjack in St Helena coastal waters. In 2016, the catch exceeded 100 tonnes, but dropped to only 8 tonnes in 2017. 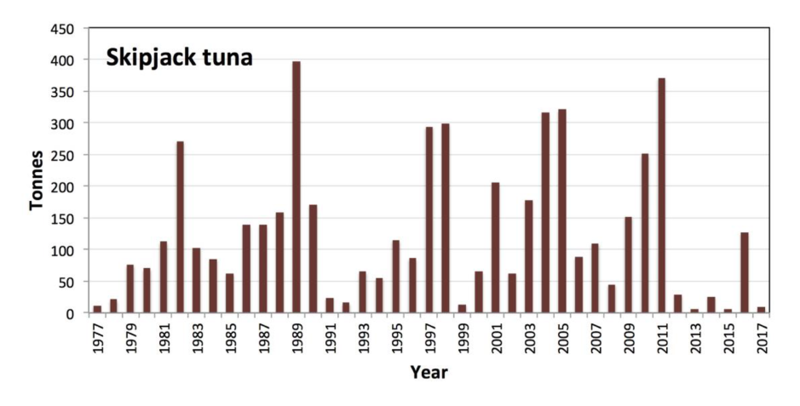 Skipjack tuna are found seasonally in St Helena waters and mostly caught between February and May. Catches in St Helena waters are seasonal and unpredictable. The average annual catch is 29 tonnes, with good years (e.g. 2011) interspersed with years when little or no albacore is caught (e.g. 2014, 2015). Albacore do not associate with the island or seamounts but are generally caught within 20 miles of the coast. Peak catches are normally between July and September. Wahoo is found worldwide in tropical and sub-tropical seas (Brown, 2014). Wahoo reach 2.5 m in length (~ 80 kg; Edwards, 1990) and are regularly caught in St Helena waters, either by trolling (lure pulled behind the boat at speed) or with pole and line. Fishing vessels regularly troll two lines en route to and from the fishing grounds but will also target certain parts of the coast. 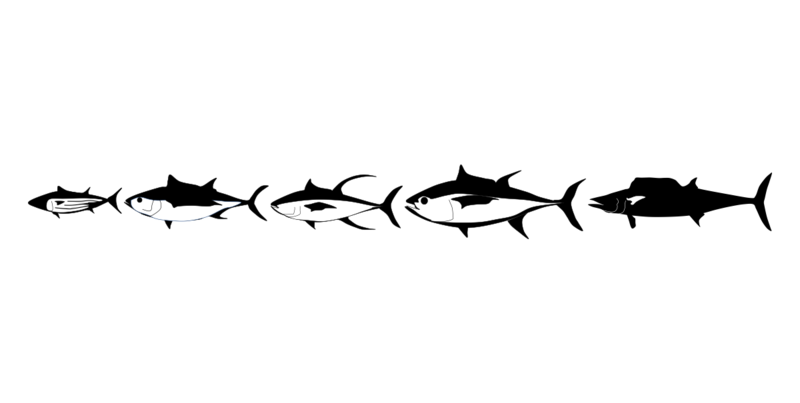 Annual landings vary from 10 to 35 tonnes and wahoo fetches a higher price than any of the tuna species. Collins, M.A. 2017. St Helena Fisheries Sector: Review & Strategy (2016-2025). A report for the St Helena Government. Clingham, E. 2015. Sustainable development and management of St Helena’s fishery and tourism industry. Darwin Plus Project Proposal DPLUS-039 (April 2015 – April 2017). Edwards, A. 1990. Fish and fisheries of Saint Helena Island. Published on behalf of the Education Department of the Government of St Helena by the Centre for Tropical Coastal Management Studies, University of Newcastle upon Tyne, England. pp.152. © 2018 St Helena Tuna. All Rights Reserved.